Live updates from Donald Trump and Hillary Clinton’s face off at Hofstra University in Hempstead, New York. On Monday night, Hillary Clinton and Donald Trump go up against each other for the first of three debates leading up the 2016 presidential election on November 8. Much is at stake for both candidates, as recent national polls show Clinton hanging on to a narrow lead. 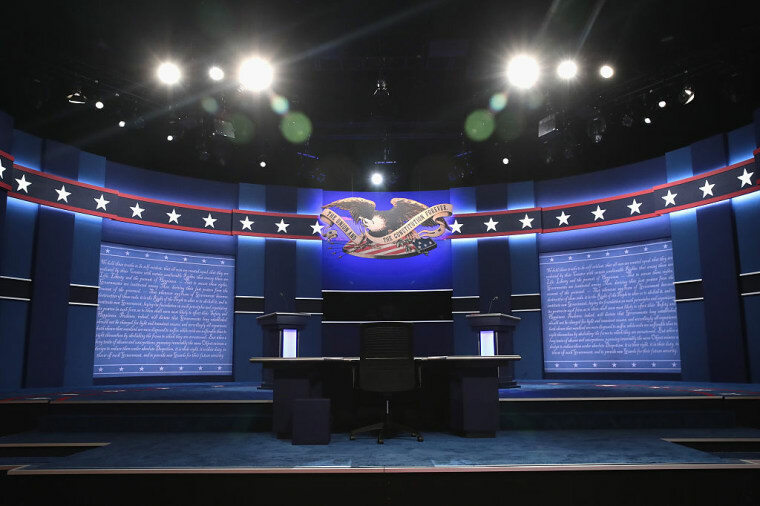 The debate will begin at 9 p.m. EST and will be broadcast live from Hofstra University in Hempstead, New York. Watch the livestream of the debate here via The Washington Post. Update (8:43 p.m. EST) Rick Rubin is in attendance at tonight's debate. Update (8:55 p.m.): Bill Clinton and Melania Trump have entered the building. Update (9:01 p.m. EST): Bernie Sanders is watching the debate at home in Vermont. Update (9:06 p.m.): Donald Trump and Hillary Clinton have taken the stage. Update (9:17 p.m.): Trump appears to have a case of the sniffles. Trump has a sniffle right now in front of 90 million people because God exists and He has a karmic sense of humor. Trump got that mid-70s Scorsese thirsty nose sniffle. If there aren't 15 Trump's Sniffle accounts set up by now then I don't know you anymore Twitter. Update (9:21 p.m.): Donald Trump addresses Clinton as 'Secretary Clinton,' followed by "I want you to be happy." Update ( 9:23 p.m.): Trump claims he "never said" global warming was a hoax. Update (9:31 p.m.): Donald Trump is on the attack. Clinton: "I have a feeling by the end of this debate I'll be blamed for everything." Update (9:33 p.m.): Hillary Clinton has a live fact checker on her website. Update (9:40 p.m.): As Clinton and Trump continue to spar, viewers at home are trying to locate moderator Lester Holt. We need a new hashtag: #whereislester. Dude is invisible while they still argue and interrupt each other over the second question. Update (9:43 p.m.): According to some counts, Donald Trump has interrupted Hillary Clinton twelve times. Update (9:45 p.m.): Hillary Clinton on gun control: "We have to tackle the plague of gun violence." Update (9:49 p.m.): Donald Trump on race relations: "We need law and order." "African American and Hispanics are living in hell...you walk down the street and get shot." "Stop and frisk was ruled unconstitutional in New York." ~ Moderator Lester Holt. Update (10:05 p.m.): Donald Trump on "birtherism." Update (10:07 p.m.): Big Sean has shared his thoughts on the election. Update (10:13 p.m.): A flow chart of Trump's thoughts on national security. Update (10:14 p.m.): YG makes his opinion clear. Update (10:28 p.m.): Hillary Clinton shares her concerns about Donald Trump's foreign policy. Update (10:39 p.m.): Hillary Clinton responds to Trump's comments about her lack of "stamina." Update (10:41 p.m.): Donald Trump and Hillary Clinton have exited the stage and the first debate has concluded.